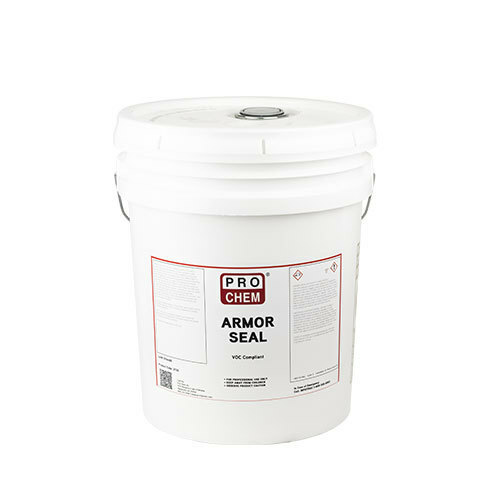 Armor Seal | Pro Chem, Inc.
ARMOR SEAL is an odorless, colorless solution of specialized reactive chemicals that penetrates concrete surfaces to seal, densify, and harden concrete. It is VOC compliant in every area of the country and environmentally safe to use. ARMOR SEAL is great for applications where there is long term resistance to dusting, black rubber tire marks, and water. This solution of chemicals penetrates into the concrete where it reacts with free calcium to form insoluble calcium silica hydrate, which makes concrete more water, stain, and abrasion resistant. This process makes for easier maintenance and longer life of the surface. Drying Time: Approximately 2-4 hrs at 70°F. Allow treated area to dry before opening to traffic. Dry time is temperature, humidity, and wind dependent. NOTE: The use of a mechanical scrubber will increase the effectiveness of the application. The treated surface will develop a “polished” appearance over time. For colored concrete a test application is recommended.